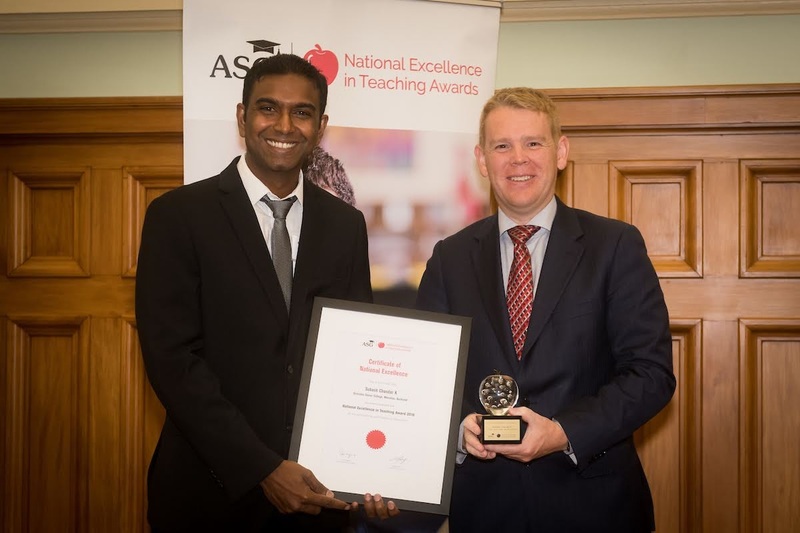 They say if you love your job, you’ll never work a day in your life – and the maxim holds true for Subash Chandar K, recently awarded the 2018 ASG National Excellence in Teaching Award (NEiTA). The multi-award winner had a rocky start to his teaching career. Originally studying to be an engineer, Chandar K failed his first year of university and ended up with a job at Disney World Florida. It was an experience with a young girl who wanted to learn how to write her name in his language that led him to discover a passion for teaching. “As I kept teaching her more of my language I got this really good feeling that I was doing something valuable,” he says. He changed his degree to maths education – and failed for another four years. “People told me to quit. People told me to walk out of teaching, you know, ‘you can't even pass maths. How are you going to become a maths teacher?’ I had every sort of negative connotation thrown at me. The Ormiston Senior College maths teacher chuckles as he reflects on his role now. “My wife actually told me that ‘you don’t go to work, you actually go to a place where you have fun,” he says. Chandar K's role keeps him busy as he strives to inspire his digitally-focused class. He says technology has changed the game for math teaching, presenting both opportunities and challenges. “In terms of using technology, definitely it's gotten a lot more adventurous, but I guess the challenge for a teacher is that because there's so much technology out there, you've got to constantly keep up with what's new and what's working with the kids at the moment. One memorable example, he says, is when he decided to use Sphero robots to teach students bearings a few years ago. “I think the kids could actually see … how bearings are being used in the class. They learnt bearings within a couple of sessions compared to the old way of teaching where we would struggle for weeks to try and get that concept through,” he says. He has also encouraged the use of video teaching amongst his team to enhance their pedagogy. “…each one has their own YouTube channel … so I try to encourage the team to make videos based on their style, so they've got their own library of videos that they can actually share with their students as well, which actually encourages kids to kind of learn at anytime, anywhere,” the inspired educator says. In fact, Chandar K started his own YouTube channel, infinityplusone, way back in 2013 – just for a trial to see how it would go, he says. Originally, he wanted to test his theory that kids would only learn when they were ready to, and whether any students would be interested if he offered teachings outside of regular school hours. Interestingly, those 450 students weren’t all his own – they joined the tutorial from all over the country, demonstrating a national need. He says his YouTube lessons come in handy, especially around exam time, when students use them for revision. “I wanted to actually shift that whole approach … creating an environment where learning can actually happen anytime, anywhere. And what I'm learning more now is that you can't walk into a classroom and expect all 30 students to be ready to listen to you at the same time, because the reality is that their learning styles are different, their learning levels are different, they come in with different prior knowledge. Along with his NEiTA award, Chandar K was selected as the 2019 ASG Space Camp Teacher Ambassador and is set to jet off to NASA’s Space Camp in the US later this year. He hopes he will be able to use some of his experiences from the camp in his classroom when he returns. “I've never thought for a single moment in my teaching career that I'd actually be heading to Space Camp of all places – as a teacher you just don't think like that. “For me, what I'll take most out of the Space Camp is meeting all these teachers and seeing what they are doing in their classes and respective countries to support kids and … expanding that network and actually swapping ideas from across the globe to see the bigger picture. Not surprisingly, Chandar K has lofty goals. He has his sights set firmly on using his recent awards success as a springboard to achieving them. One of his long-held dreams is to set up a STEM academy for disadvantaged Māori and Pasifika students. He hopes to shift the thinking around his local area, South Auckland, so that people can see the value and potential of students with an interest in STEM. His plan for the academy is for students to come in and work on their own STEM ideas, mentored and guided by leaders in the field. “At the moment, there are kids coming into school and they think the only path to success is through university. But what I'm hoping to do is, if kids actually have ideas and then have creative solutions, why don't we give them a platform to actually let them explore these ideas? He’s also keen to look into how to better promote the career of maths education to young people, to encourage them to take up the mantle as New Zealand’s current crop of math teachers reaches retirement. Chandar K hopes that his award win will give him a platform to pursue his dreams. “I think if I have a voice, if I'm sharing these ideas over the next few years, then potentially I'm hoping that people will take note … I guess that's why for me the NEiTA award here meant so much. It gave me a voice to actually speak to people and share ideas and actually think about what's the next thing that we can do to support some of these really at-risk students.